Republicans long ago embraced a whites-only political strategy—and continue to reap its rewards in Southern states. That panicked counsel proved to be the high point of GOP minority-outreach efforts. In Congress, as immigration reform went from cheap talk to real legislation, the hard-liners circled the wagons, pressuring Speaker John Boehner into declaring the measure “dead on arrival.” Now Hannity is opposed to reform because he thinks “it won’t help the GOP in future elections,” and Hume calls his own argument “baloney,” contending that the Latino vote is “not nearly as important” as the white vote. This is an example of what psychologists call “adaptive preference formation,” or as Aesop allegorized in “The Fox and the Grapes”: if you can’t get something, convince yourself it wasn’t very good in the first place. The most insidious of these arguments—because it comes wrapped in the cool logic of charts lacking explicit racial animus—belongs to Sean Trende, an analyst with Real Clear Politics, who composed an influential four-part series purporting to show that Republicans can survive and indeed thrive as a de facto whites-only party. Simply by finding the 6 million “missing white voters” who sat out 2012, Republicans can roll Democrats in presidential elections 2016 to 2044 (sorry, Hillary! )—even in a worst-case scenario in which 90 percent of all minorities vote Democratic. As Ruy Teixeira and Alan Abramowitz point out at Think Progress, there’s a heavy dose of magical thinking in Trende’s math, which assumes a boost in turnout exclusively among whites instead of the electorate as a whole. Even more magical is Trende’s strategic advice to the GOP: court downscale, rural white voters by embracing the economic populism of Ross Perot, whose platform included higher taxes on the rich and universal healthcare. Good luck selling that to the Tea Party. For candor and a certain brute common sense, one must turn to Pat Buchanan, who starkly warns that the “demographic winter of white America” is nigh. His solution: “no amnesty, secure the border, enforce laws against businesses that hire illegals [sic], and impose a moratorium on new immigration.” And there you have a succinct blueprint for the construction of Fortress White America: evict as many brown people as legally possible; build a wall to keep out the rest. This has all delighted Democrats, who are savoring their schadenfreude. “Keep doing it…the Democrats love it!” quipped MSNBC’s Joy Reid, echoing Democratic chest-thumping after the 2012 election about how a “coalition of the ascendant” or an “Obama realignment” would secure a “permanent majority.” That might be plausible in terms of upcoming presidential elections, but what this triumphalism misses, as Thomas Edsall has pointed out, is the success of the GOP whites-only strategy at the state and local levels, especially in the South—not to mention its disastrous consequences for real people. For the past two decades, the GOP has waged a crusade to redraw the political map so as to maximize the number of white voters in Republican-leaning districts, while lumping as many minority voters as possible into Democratic-leaning ones. The siege mentality is baked into the very DNA of the party, and it creates a perverse incentive structure in which only white voters matter. This precision racial gerrymandering has been frighteningly effective. In 2012, Democratic House candidates won 1.4 million more votes than Republicans, who nonetheless control 54 percent of the seats in that chamber. Similarly, while many Southern states have been getting bluer (and browner), Republicans have locked down Southern state legislatures by wildly disproportionate margins. In North Carolina, for example, registered Democrats outnumber Republicans 45 to 32 percent, and Mitt Romney squeaked out a two-point victory over Obama in 2012. Republicans, however, control the state Senate and House by almost 2-to-1 margins, their largest share ever. And what have North Carolina Republicans done with this historic, veto-proof supermajority? They’ve cut unemployment benefits and Medicaid eligibility, gutted environmental regulations, and repealed the Earned Income Tax Credit and the 2009 Racial Justice Act, which allows death row prisoners to appeal their sentence if they can prove race was a factor in sentencing. If the GOP budget goes through, more programs will get the ax: early childhood education, pay for teachers and teachers’ aides, campaign financing, water safety, even the state income tax, which will be replaced by a regressive sales tax. Polling has shown that the majority of North Carolinians reject these measures, but enough voters who support them live in the white districts, where the GOP has retrenched. It’s a similar story in Texas, where a supermajority of Republicans has pushed through voter ID laws, rejected Medicaid expansion and cut school budgets. Yes, Texas State Senator Wendy Davis became famous for filibustering a bill that would in effect shut down the state’s abortion clinics, but the bill eventually passed, and its author, State Representative Jodie Laubenberg, hasn’t faced an opponent in the last three elections. Her district was drawn to be 67 percent white, a bleached electoral haven in a state that is majority-minority. One day, the ultimate victims of Republican efforts to build a whites-only party may be the Republicans. But for now, it is women, gays, minorities and poor people who are being royally screwed. As the killing of Trayvon Martin by George Zimmerman reminded us, there is nothing more dangerous than a white man standing his ground in his own castle. 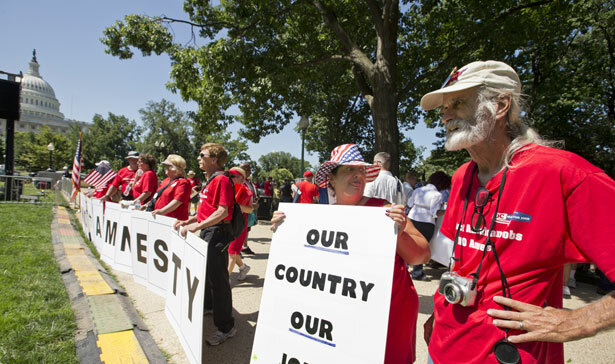 George Zornick looks at the ugly, racist side of the immigration reform opposition.